Are there contributing factors in periodontal disease? The importance of gum tissue. What is a periodontal examination? Are there different types of periodontal disease? What can be done about gum recession? Calculus: Plaque bacteria that were never removed completely with brushing and flossing. The hard deposit of mineralized plaque that forms on the crown and/or root of the tooth. Also referred to as tartar. Gingiva: The soft tissue that covers the jawbone. Also referred to as the gums. Gingivectomy: The surgical removal of gingiva (gum). 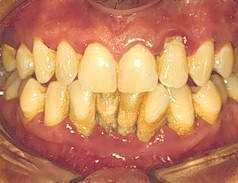 Gingivitis: An inflammation or infection of the gingiva (gum tissue); the initial stage of periodontal disease. 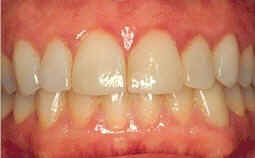 Gingivoplasty: A surgical procedure to reshape or repair the gingiva (gum). Graft: A piece of gum tissue or synthetic material placed in contact with tissue to repair a defect or supplement a deficiency. Periodontal: Relating to the tissue and bone that supports the tooth (from peri, meaning “around,” and odont, “tooth”). Periodontal disease: The inflammation and infection of gums, ligaments, bone, and other tissues surrounding the teeth. Gingivitis (gums) and periodontitis (gums and bone) are the two main forms of periodontal disease. Also called gum disease or pyorrhea. Periodontal pocket: An abnormal deepening of the gum crevice. It is caused when disease and infection destroy the ligament that attaches the gum to the tooth and the underlying bone. Periodontal surgery: A surgical procedure involving the gums and jawbone. Periodontics: The dental specialty that deals with and treats the gum tissue and bone that supports the teeth. Periodontist: Dental specialist with expertise in surgically treating the effects of periodontal disease. Periodontitis: Inflammation of the supporting structures of the tooth, including the gum, the periodontal ligament, and the jawbone. Plaque: A film of sticky material containing saliva, food particles, and bacteria that attaches to the tooth surface both above and below the gum line. When left on the tooth it can promote gum disease and tooth decay. Periodontal disease, also called gum disease, periodontitis, or pyorrhea, is a complex disease which can be acute or chronic with flare-ups and quiet periods, like any chronic disease.Â Periodontal disease involves the inflammation of the gum tissue, and the resulting destruction of the bone that holds the teeth in the jaw by the inflammatory process.Â It is the number one cause of tooth loss in adults.Â Periodontal disease also has implications for increased risk for other health problems. In its most basic form, the answer to this question is bacteria. There are over 450 different species of bacteria that can live in our mouths, some of which cause periodontal disease.Â The current understanding of periodontal disease attributes 50% of the destruction directly to the bacterial toxins and 50% to the inflammatory process that they trigger in our own immune systems. Thanks to Mr. Bill Landers, President at OraTec for his expertise, review and comments. Yes:Â how effectively you clean your teeth, the type(s) of bacteria present, tooth position and alignment, your general health and resistance, saliva (amount, pH, viscosity), medications you may be taking, cigarettes and tobacco products are some of the most significant factors. The gum tissue around the teeth overlies the bone that holds our teeth in place. The top of the gum that is visible is approximately 2-3 millimeters (one millimeter is about the thickness of a dime) higher than the actual attachment of the gum to the tooth in health, making a space similar to a turtleneck collar. Within this space, bacteria live and multiply. These bacteria produce toxins that cause our bodies to respond in a localized reaction called inflammation. In periodontal disease, the fibers that attach the gum to the tooth are destroyed by the process of inflammation.Â Once these fibers are damaged, the bacterial infiltration can continue to deeper levels of the gum and bone typifying the advancing nature of periodontal disease. Gingivitis is inflammation of the gums and is apparent with red gums that can bleed upon touching (brushing and/or flossing).Â Because inflammation of the gums must occur before the bone is destroyed, gingivitis, or inflammation of the gums is the precursor to periodontal disease.Â Gingivitis may persist for years before the inflammatory process allows destruction of the bone to occur.Â The important thing to note about gingivitis is that it cannot be distinguished from periodontal disease simply by observation. To determine if someone has gingivitis or periodontal disease, a periodontal examination must be performed. Pus between the teeth and gums when pressed. Permanent teeth that are loose or separating. Any change in the way your teeth fit together when you bite. Any changes in the fit of your partial denture. Bad breath or bad taste. By far the most prevalent form of periodontal disease is adult periodontitis. This is classified into mild, moderate and severe types, depending on the amount of bone loss.Â Mild periodontitis occurs when the probing depths of the gum crevice range from 4-5 millimeters.Â Moderate periodontitis is designated for probing depths between 6-7 millimeters, while severe periodontitis occurs when depths of 8 millimeters or above are observed.Â Since tooth roots average between 10-12 millimeters long, the deeper the pocket (higher the measurement) the more severe the disease and the greater chance for tooth loss.Â Different readings can occur around different sides on the same tooth. Yes, by direct contact passing the disease causing bacteria. Treatment for periodontal disease depends on the severity of the problem.Â What all types of treatment do is to reestablish healthy gums that can be maintained and act as a barrier to future disease.Â Bacteria must be effectively and thoroughly removed on a daily basis for permanent success to occur. The first type of treatment involves what is called deep scaling or root planing.Â It is the most conservative treatment available and is commonly called the Non-Surgical approach.Â This is almost always done with local anesthetic and rarely causes residual discomfort.Â In many cases it is best to do each pocket more than once as it is impossible to remove all deposits and debris in the deeper pockets on the first treatment.Â When successful, the gum will reattach at a higher level than before thus reestablishing a better barrier to the bacteria and the disease process will be eliminated.Â There are many ways to enhance these results, including first among these improved homecare techniques.Â Other treatment options include antibiotics (oral orÂ directly placed next to the teeth). The second major treatment is surgery.Â Surgery is not a cure for the disease.Â Surgery helps create a more maintainable periodontal situation.Â The simplest type of surgery is called a gingivectomy.Â A gingivectomy is the surgical removal of the diseased gum tissue with the healing of the gum at a lower level. Depending on the pocket depth, this may involve massive tissue loss. More common are “flap” procedures.Â While there are different types of “flaps” and different techniques, the goal is to temporarily move the gum back during the surgery, remove the underlying disease process and if necessary, change the contour of the bone.Â The gum tissue is then sutured back in place.Â With successful healing, the gum will reattach at a higher level than it was when the disease process was present, although never back to where it was originally.Â Other surgical techniques include the implantation of new bone and the use of a synthetic bone matrix that stimulates bone growth.Â The last treatment is the use of extractions, or removal of the teeth.Â Certainly, the goal of any treatment is to save the teeth, however there are times when the bone destruction is so great around one or more teeth that it threatens to infect the tooth next to it.Â If the adjacent tooth has a level of bone that can successfully be treated by one of the methods mentioned above, yet its next door neighbor cannot, then removal of the hopeless tooth can only help the long term prognosis. It is not uncommon to find periodontally involved teeth often respond positively to root canal treatment.Â Many studies have shown periodontal disease causing bacteria within the tooth.Â Even with antibiotic treatment these bacteria are not eliminated. Some upper molars, which usually have three roots, often respond positively to the removal of one of the smaller roots – this is referred to as a root amputation. Tooth position and bite are very significant factors.Â When the forces on teeth are more than the supporting bone and gum can withstand the underlying periodontal disease can be aggravated.Â The ultimate successful treatment of periodontal disease usually involves some sort bite adjustment and/or orthodontic treatment (braces). It cannot be emphasized enough that while treatment may re-establish a healthy gum condition, if the bacteria are not regularly and effectively removed, the disease will reappear. Gum recession occurs when the gum and supporting bone are destroyed so that the top of the gum recedes away from the biting edge or chewing surface.Â This is the origin of the expression “long in the tooth”. Gum recession is most often caused by too much force on teeth; however, it can be also be caused by periodontal disease (NOTE:Â it is not caused by toothbrushing, click here).Â Gum recession caused by periodontal disease most commonly occurs where the inflammation caused by the disease process destroys the attachment of the gum progressively down the root. Treatment options depend on the nature of the problem and the cause.Â If root surface sensitivity occurs, early treatment may simply involve desensitizing the root surface.Â Sometimes a bonded filling can serve as a barrier to temperature.Â Grafting of gum tissue is very common and successful for noticeable cases of recession.Â If the bite is the significant underlying cause, then a bite adjustment and/or orthodontic treatment (braces) is indicated.